Arivaca Lake Arivaca Lake is located in Pima County in Southern Arizona. Arivaca Lake is located in Pima County in Southern Arizona. You travel 60 miles south of Tucson along the scenic Ruby Road. You can follow these easy directions to Arivaca Lake. You take the Amado Road exit on Interstate 19, head west to Arivaca. Turn south out of Arivaca on FR 216 about a mile then east on FR 39 about 5 miles to a road that turns left (east) to the lake. Via the Ruby Road: take Interstate 19 north from Nogales 8 miles to the AZ 289/Ruby Road exit, head west 10 miles on this paved road past Peña Blanca Lake and finally continue on FR 39 (unpaved) for 26 miles to the primitive road (FR 4130) that turns right (east) to the lake. Above all Arivaca Lake is set in rolling grasslands with rocky bluffs and mountains in the distance. The lake is surrounded by cattle ranches and mostly private land. 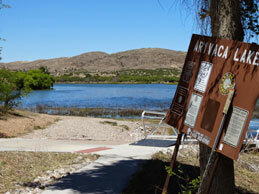 Arivaca Lake facilities include a toilet and a primitive boat ramp. What more do you need. This 90-acre impoundment built by the Arizona Game and Fish Department is a good place to go fishing or bird watching. Fish include large mouth bass, catfish, blue gill and sunfish. Furthermore electric trolling motors are permitted. Here’s a little history from the Arizona Department of Commerce on the town of Arivaca to give you a little background on were you will be going. There are also lots of ghost stories and legend of silver stashed away in adobe huts along the roads. “The name Arivaca derives from “la Aribac,” an Indian word for “small springs.” Located 11 miles north of the Mexican border, the area contains some of the nation’s oldest mines. Mapped by Father Eusebio Kino in 1695, the locale may have been a Pima Indian village. Attracted by grazing land and precious metals, Spaniards later came to the area and developed mines which were worked by Indians. Finally in 1833, Mexico approved the Ortiz brothers’ petition to raise cattle and horses on 8,677 acres forming the Aribac Ranch. However, if you are looking for a great uncrowded getaway – Arivaca Lake is the place. No garbage services are provided to this area, therefore, even if you bag your trash neatly before you drive off and leave it, you’re littering. If you brought it in – take it out with you. Finally, the U. S. Forest Service is a good place for more Arizona information. Don’t miss Nathaniel Morrison’s stop at Arivaca Lake in Thirty Arizona Lakes In Thirty Weeks.